This Sour Cream Coffee Cake has a cinnamon walnut streusel topping and inner streusel swirl, just like my Grandma used to make! 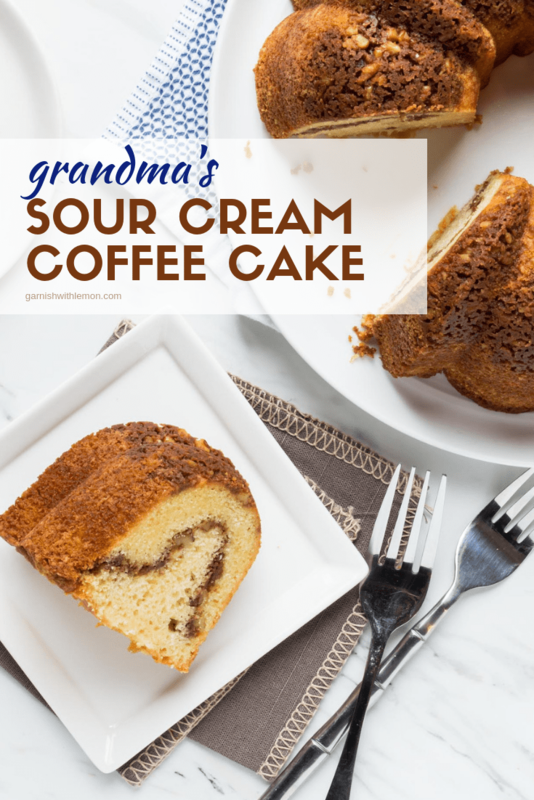 This Sour Cream Coffee Cake recipe is a classic – and I mean that literally. It’s a recipe that originated with my grandma, was passed down to my mom and now to me. Sometimes the classics are the best, and this coffee cake is no exception. A lot of coffee cakes get all fancy with fruit and frostings. Not this recipe. 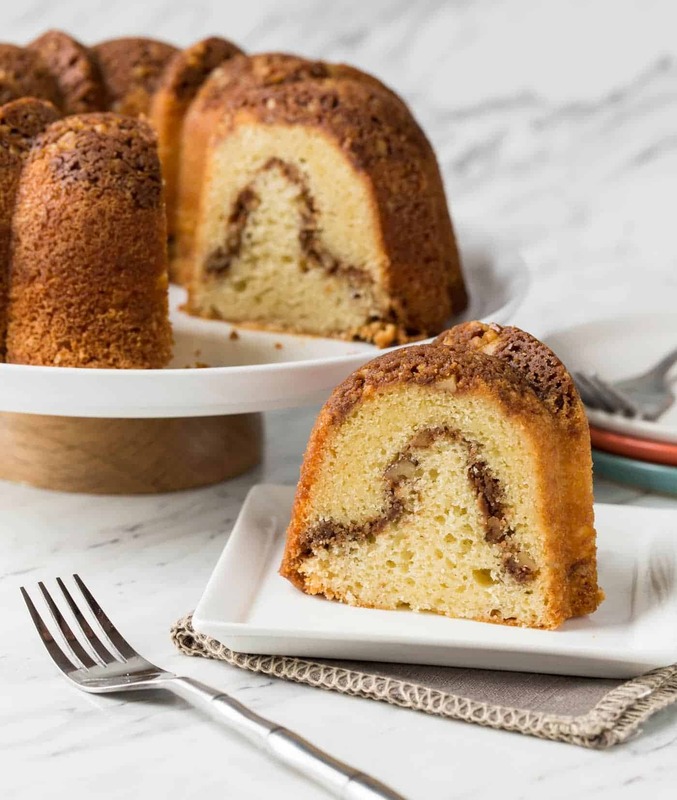 My Sour Cream Coffee Cake is pretty traditional with a tender crumb and yummy streusel swirl that gives you a taste of cinnamony-nut goodness in every bite. Delicious for brunch, this coffee cake is also just the right amount of sweet for your afternoon cup of coffee or tea. Tip: Not a fan of walnuts? Swap in your favorite nuts instead. I’ve made it with pecans and almonds, and both were excellent! Another bonus for this coffee cake recipe? It keeps well for days, which is a big perk when you’re trying to prep ahead of time for brunch guests (if you’re interested in sharing, that is). 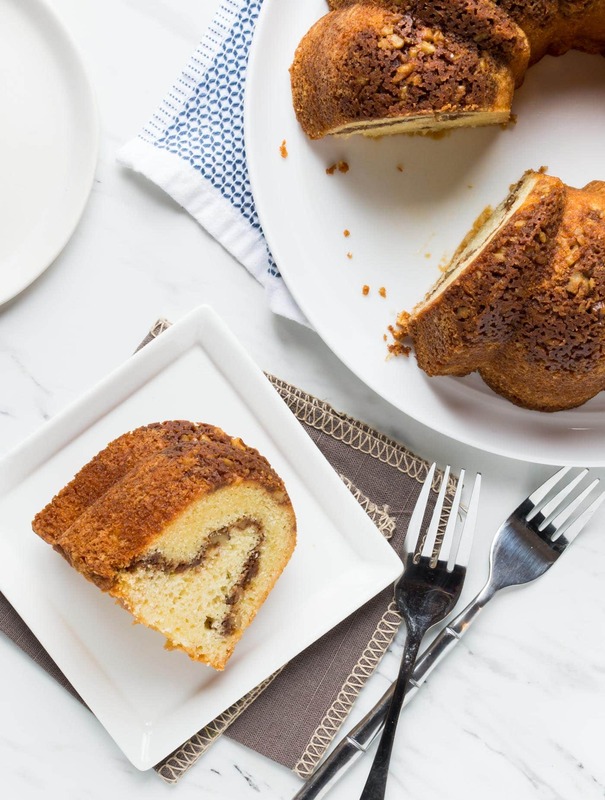 The streusel layer in the middle of this coffee cake is a game changer! Preheat the oven to 325 degrees. Grease and flour a bundt pan. Set aside. Combine all ingredients with a pastry blender or two forks until mixture resembles coarse crumbs. Set aside. Combine flour, baking soda and baking powder in a small bowl and gently whisk to combine. Set aside. Place butter and sugar in the bowl of a stand mixer and mix on medium speed for 2-3 minutes or until creamy. Add eggs, one at a time, mixing well after each addition. Stir in vanilla. Alternate adding flour mixture and sour cream and mix gently until thoroughly incorporated. Batter will be thick. Pour half of streusel mixture in the bottom of the bundt pan and spread evenly. Add 2/3 of batter on top of streusel and gently level with spoon. Sprinkle remaining streusel evenly over batter and top with remaining 1/3 batter. Smooth top and bake for 50-60 minutes or until toothpick inserted in cake comes out clean. Cool completely in pan and invert on serving tray when ready to eat. Keeps covered for several days. I’ve got this in the oven now. It looks and smells amazing. It’s been 50 minutes and nowhere near done. 325 temp seems low. Should oven be set to 350? It’s going to need at least 10 more minutes at 325. Hi Sandra, Oven temps can vary, so I’d stick to the toothpick test to ensure doneness. Also, the size of your bundt pan can make a difference, too. Smaller pans will take longer because the cake is “thicker”. Hope you enjoy it! This came out perfect. It took 60 minutes baking time. It’s moist and not overly sweet which I like. My husband couldn’t wait for it to cool all the way and has had two pieces already. I will be making this often. Thank you. This comes out perfect as written. Tender and delicious. Thanks for sharing. So glad you enjoyed it, Ellen! I made this today for brunch with friends. It was a major hit! I will definitely make this again! Hi Barb, I’m so glad you enjoyed it! Thanks for stopping back to let us know how it turned out for you. Would this keep well if i made it at night for the next morning? Hi! I’d like to make this as a treat for Christmas morning. Can it be made ahead and frozen? Would I still cool it completely in the pan before removing? Thanks! Hi Julie, yes you can freeze this coffee cake. Allow it to cool completely and wrap it tightly before freezing. Enjoy! Can I add raisin ? I’ve never tried adding raisins before, Carol, but I don’t see why they wouldn’t make a tasty addition. Give it a go and let us know how it turns out! Anna, i have put raisins and or dates in mine. Fruit just toss it in a little flour first. Also do that with dried fruit cranberries etc. This way they don’t stick to each other or sink to bottom of cake. Fun, enjoy. I love to experiment. Yum! Thanks for sharing your tips, Patricia! Hi, I don’t have a stand mixer, would this work well if I just use a hand mixer? Yikes! I’m not experienced with baking at altitude. Hopefully someone in a similar location will chime in with advice. BLUE RIBBON – i made this for our County Fair. It was Great won first place. I just added sliced apples tossed in cinnamon and sugar and put in the middle. Now i put any fruit i have on hand. I love hearing this! Enjoy!! I have made this same recipe for family and friends but sometimes, just to be different, I add some mini chocolate chips in the middle of the cake . Great stuff!